Just a reminder that those that follow/like Frost Me! on Facebook get an extra dab of frosting to each day's theme! 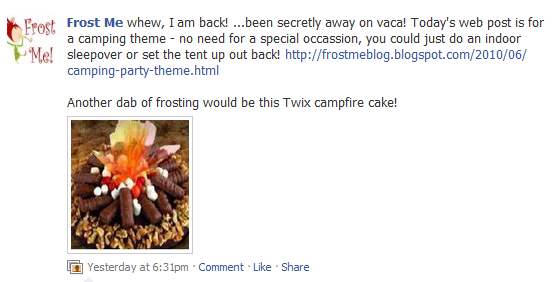 Here's the frosting you missed yesterday if you aren't a fan yet - a twix and marshmallow campfire cake! Also, did you miss the cupcake cookbook giveaway? Hurry up and enter here! Ends tomorrow night!